3/1/2017–WINSTON-SALEM, NC–The Winston Salem Composite Squadron (NC-082) held their annual Dining-Out and Awards Ceremony on 17 February 2017. The awards and commendations ceremony was held at the Masonic Center in Winston-Salem. Approximately 125 squadron members and guests enjoyed dinner provided by KevMark Catering Services. 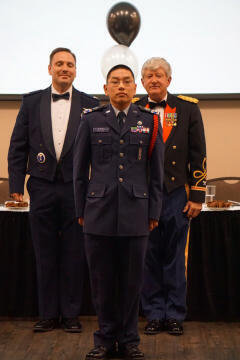 Col R. Jason Bailey, the North Carolina Wing Commander, presented several awards and commendations along with Lt Col Urbanek, the Squadron Commander of the Winston Salem Composite Squadron. Lt Col Cheek also presented awards. The guest speaker, Don Masura, gave an inspiring motivational speech on leadership. C/Lt Col Bouffard was awarded the Daughters of the American Revolution Silver Medal which was presented by Ms. Robyn Rutledge. Col Bailey presented the Winston Salem Composite Squadron with a Unit Citation Award. Lt Col Cheek was presented with a Meritorious Service Award from the CAP National Commander, Maj Gen Vazquez, which was presented by Col Bailey. C/Capt Matthews received the Amelia Earhart Award and was promoted to the rank of cadet Captain. Additional awards and citations were awarded throughout the evening. Photos and videos of the event can be found at nc082.org at the link for galleries.